Island Frydays! – Go There. Try That. If you’re up for a food adventure, Island Frydays is the place to go! 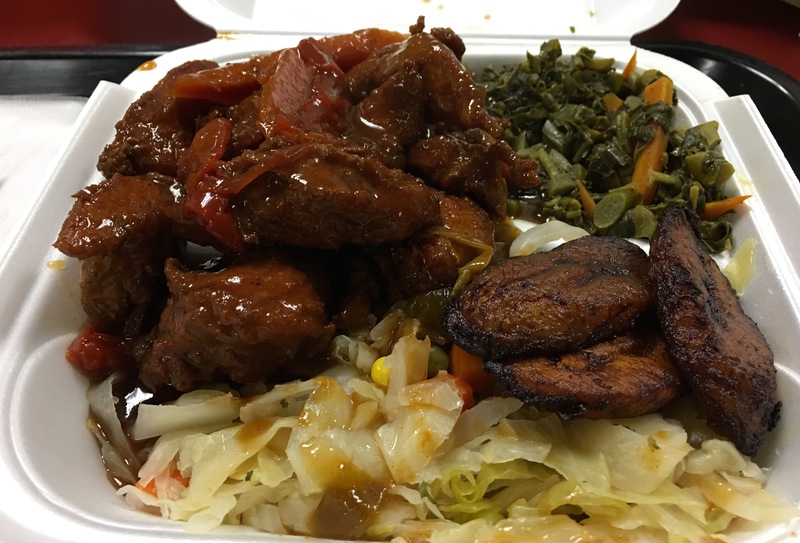 This restaurant, which serves Jamaican and Caribbean food, makes up in flavor what it lacks in atmosphere. Instead of fancy plates, a wait staff, and ambiance, it’s self-ordering, takeout containers, and no frills dining. Sometimes, that’s exactly what a girl wants! 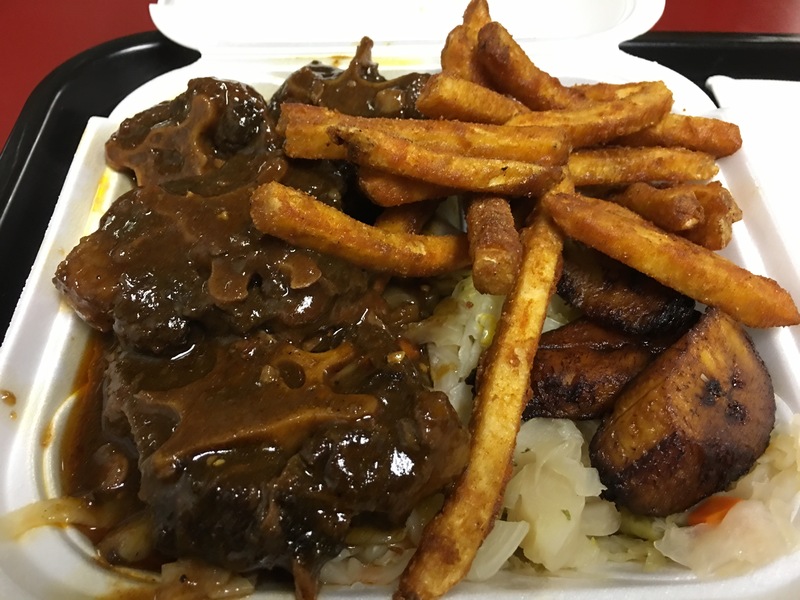 Island Frydays on Vine St.
At Island Frydays, each order comes with a main dish and two sides. Plantains are served with each meal. The Cabbage, Jamaican greens, and Jerk Fries are our favorites so far. The greens are subtle, which is nice if you find some collard greens too strong. The jerk fries are crispy and well-seasoned. In regard to main dishes, I was pleasantly surprised that the servers allowed me to sample items before finalizing my order. 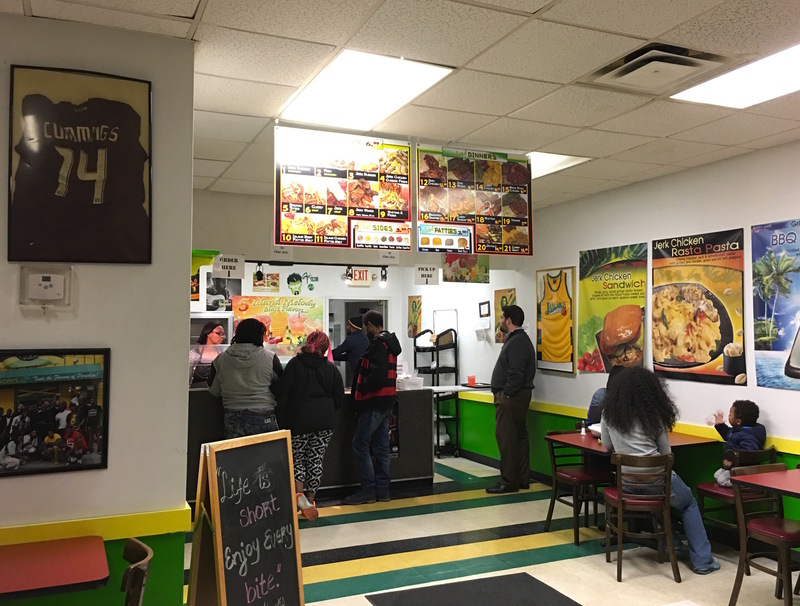 The staff is incredibly friendly, enthusiastic, and knowledgeable about the food. Plus, can’t beat the island music playing here! So for this post, I want to highlight two stars and one surpirse. I have to first talk about the Goat Curry. It’s spicy, but not hot (turns out the spice level is tamed down for the American audience). Goat Curry, we learned, is served as a special occasion dish for some Jamaican families. The curry is thick, creamy, and aromoatic. It’s reminiscent of Indian food, but different. The color is as rich as the dish is gratifying. Oxtail. Never had it before, but it’s delicious! Rich, meaty, tender, and served in a flavorful gravy; this is the bomb! Now, I did have serious reservations- I had to get over the fact that I could tell it was a tail (usually oxtail is from ox or steer). But man, this meat falls right off the bone- reminding me of short ribs. It’s definitely savory and succulent. Now for the big surprise. Beware! 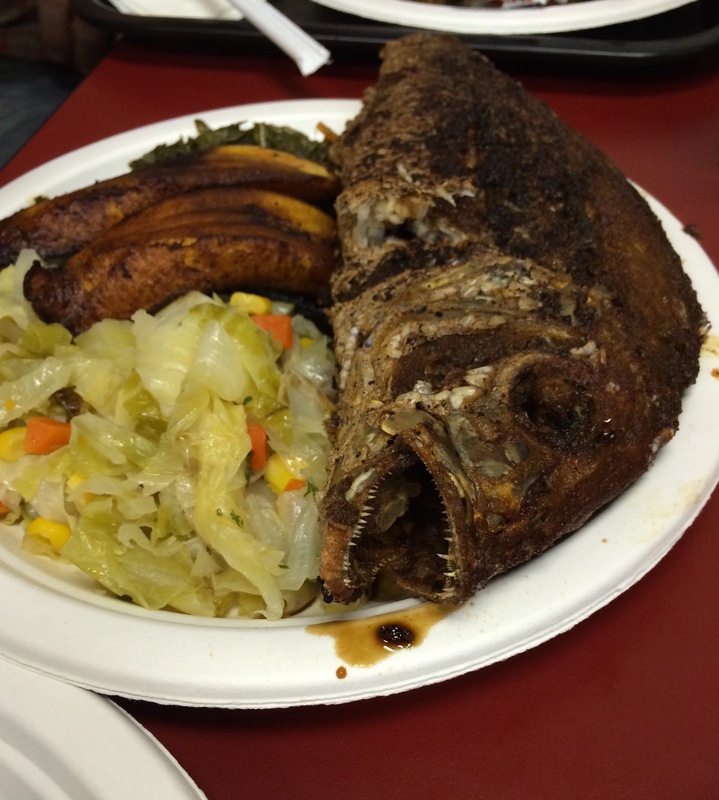 This fish, served whole, is probably the most adventurous order. My friend Korie, always up for adventure, asked the gentleman working what his favorite dish was, and this is what she got! Brave woman! Once you get past the . . . well . . . let’s face it, creepy- as- heck exterior, this fried fish is flaky and really well-seasoned. Seriously, all the meat here is so tender and the spices are unique to each dish. 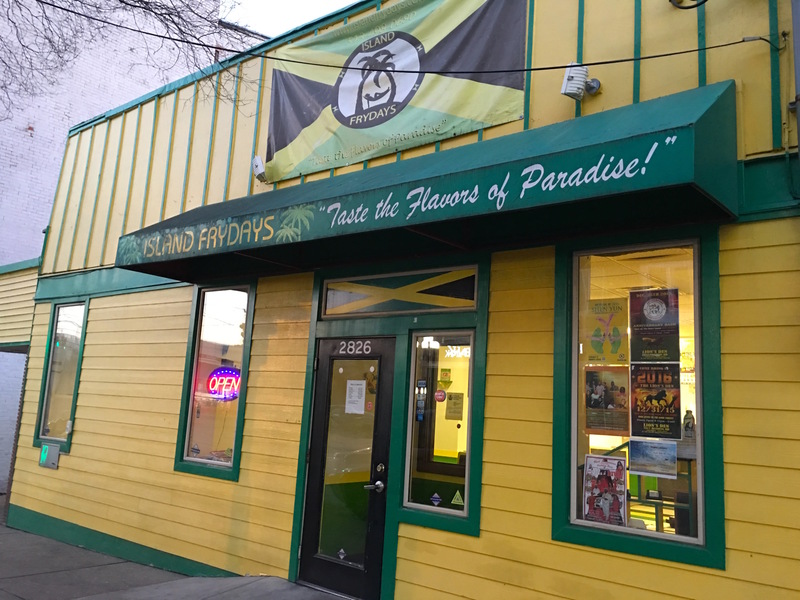 Island Frydays gets tons of takeout traffic, and the prices are great considering how big the portions are. I’m looking forward to stopping back to try the Jerk Chicken! GO THERE (Island Frydays)! TRY THAT (Oxtail, Goat Curry)!